We accept Visa, Mastercard and Discover. Unfortunately, we do not accept personal checks. Please review our Artwork Submission Guidelines before sending files. 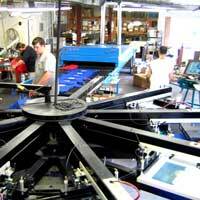 For quotes on silkscreened items, please fill out our Quote Request Form or for quotes on promotional items, fill out our Promotional Item Quote Request Form, and someone should contact you shortly. To place an order online, please use our online order form. You can also download our PDF order form. When using the PDF order form, download the file by right-clicking on it and saving it to your computer, then open it with a recent version of Adobe Reader. After filling out the form, you will be able to e-mail it to us along with any artwork files needed. The form will not send information unless you download it first.